My camera and I have been to the best races on the planet. We’ve had full accreditation for Formula One, MotoGP, the World Endurance Championship and many others. But there was one photo that had a prominent place on my bucket list—the “milk shot,” the photograph of the Indy 500 winner drenched in milk after taking the checkered flag. I wanted to capture the milk jug splash when a driver wins, the most iconic celebration in racing. And last fall over some $1 Lone Stars, Patrick George and I discussed how the 100th running of the race would be the best one to get it. I need more stickers on my Pelican. This is the story of how shooting the Indy 500 was one of the toughest events I’ve ever covered, and that I got the one shot I set out for—but almost didn’t. I talked my way into a Cadillac ATS-V for the week of the race, a car that arrived at my home at 9 a.m. on Wednesday. I had to be on the ground at IMS and shooting Thursday morning, so resting overnight halfway there wasn’t an option. I packed snacks and Red Bull, and only stopped when I needed fuel. With 464 HP on tap and 1,100 miles ahead of me, that power would come in handy. The good news was the ATS-V was surprisingly comfortable over long distances. The power delivery is linear, and getting around slower cars on the highway is not only easy, but fun. This is a car wants to be driven fast, and I may have been too weak to resist its desire once or twice. The Recaro buckets work in this car, comfortable over long stretches and perfectly snug when I met the corners. Few Recaro seats I’ve tested pull that off. They got the steering feel right, too. With my last stretch before the house in Bloomington being along some twisty back roads, I had a chance to corner this car properly. I enjoyed the hell out of the experience, but the possum I may have flattened did not. My first stop was to pick up my credentials. I snagged a spot in the smaller second floor of the media center, since the top floor is reserved for those who have covered this race several times or are with some local outlet. Hundreds of media members from around the country want to cover this race, and the Indianapolis Motor Speedway makes a point of issuing credentials to every tiny gazette and TV station in Indiana. Spots are really limited, and getting to cover this race is a privilege you have to earn, I was told. Over the next few days, shooting practice and qualifying and vintage racing and the pit crew challenge, I found out just how difficult it is to earn that privilege. I do this for a living, and cover tons of races each year, spanning several tracks, so I can tell you that I’ve never had to work harder than I did at Indy. You have to walk through thousands of drunk fans wandering aimlessly while pulling their BYOB cooler. The only separation between accredited photographers and the common fan occurs right at the spot you’re allowed to shoot from in a corner. There is no designated loop where photographers can walk or catch a shuttle to get to their intended destination. Media shuttles do not exist. I’m used to getting a variety of angles and shots when I cover a race. At Indy, this is nearly impossible. Just outside the media center are dozens of golf carts. I never saw more than two or three in use. Each time I’d walk outside, there would be no fewer than 20 locked up and idle carts. I don’t mean to complain too much, especially when I got the chance to shoot such a monumental race. I’m a professional, and I get the job done no matter what happens. I guess what I’m trying to say is that at Indy, professionals definitely earn their paychecks. Do you even Indy, bro? I’ve never had to work a grid this packed. Getting clear shots of the cars was nearly impossible. Good thing I like details. Race day began like all the others here at Indy: mobbed with people and in almost complete disorder as to what was happening where, and when, and how I could get there without spilling anyone’s beer. Minutes before the race started, I sprinted over to turn one to get a few shots. Lined up behind the pace car, nailing a couple rolling pictures against the banking was easy. When the green flag flew, it was an entirely different story. These cars were flying by at over 220 mph. No race I’ve ever covered before prepared me for getting a shot like that. Once I snagged a couple decent photos, I hit the pits. I love the action there, but it’s hard to get anything right. It’s hard to know where to be because the timing of the stops seems random, and it’s harder to get to your ideal spot because you have to respect teams’ space. At Indy, there’s the added complication of fans and guests also being allowed access, so there are plenty of cameraphones stretching out into your frame. That gun nearly nailed me. Part of the job. I darted back out to catch the final few laps and then go for my bucket list shot: the milk. I found out during the Sunday photo meeting that there was a list to request access to Victory Circle, and that this was another “members only” situation. If you weren’t a veteran shooter here at Indy, you weren’t going to be told about it. “Don’t ask if you can get added,” an IMS media rep told me. After years of skipping lines and parting ropes at exclusive events all over the globe, I somehow talked my way in. It’s fun to crash parties. I can’t tell you all how I pulled this off, but suffice it to say I’m good with words, and it didn’t involve any sexual favors. 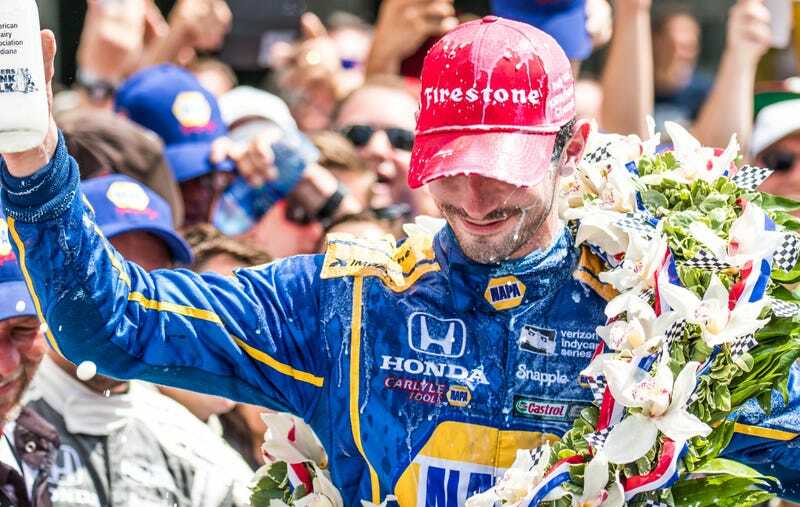 Once winning driver Alexander Rossi, his car, and the team made their way in, it was nuts. The hat dance, the poses for each TV camera, and the roaming guests were killing me. Alex kept posing with those glass jars, but no splash. TV camera guys were roaming back and forth in front of the still shooters who were penned into a designated box. A handful of fellow photographers griped, only to get a “SHUT UP! I DON’T WANT TO HEAR IT! YOU’LL GET YOUR SHOT WHEN YOU GET YOUR SHOT!” from the series’ media handler. I started to worry that after everything, the shot wasn’t going to happen for me. Nearly 20 minutes after rolling into the Victory Circle, Rossi poured that fine two percent all over his head. The week of work, with all the obstacles presented and challenges overcome, suddenly seemed a little less frustrating. I got to be part of an awesome team of contributors at Jalopnik, and every single one of them excelled this weekend to produce some great content for all of you to enjoy. Stef, Roselli, Torch, and David did one hell of a job, and I hope you all appreciated seeing the coverage come together. Will I go back and try and get the milk shot again? I can’t say. You’ll hear many people around Indy talk about tradition, history, and not wanting to change a thing. But the track’s bias towards the vets doesn’t inspire this rookie to return. In the end I still got my shot so I can’t complain much—this job is fun, but no one ever said it was easy. If you want to follow my work on the usual social networks, go to my portfolio site, Instagram, and Twitter. I post to Instagram daily, and am all over the place shooting fast things every couple weeks. Obligatory stop on any drive along I-35 between Austin and Dallas. Easily the coolest helmet on the grid this weekend. One year after nearly dying by bleeding out in the cockpit after a crash. Amazing comeback by The Mayor. The eyes of Gaga are upon you. Tons of laps under yellow flag conditions. Names of all the previous winners of the Indianapolis 500 were printed on every single race tire used over the weekend. The turn 1 grandstand, moments before the green flag. There was no shortage of honor for those who served and continue to serve this great nation. They keep leaving this socket wrench in the car.